The McClamp THE STICK eliminates wind effect for improved sharpness of photographs. It sticks into the ground, and can hold such items as gray cards and 12" reflectors. It improves compositions by providing more control of your subject and background. Explore new creative angles by adjusting the 26" flexible arm while the clamp holds your small subject in place. The holding clamp has two surfaces - firm plastic outside jaws for a firm grip, and soft inner neoprene jaws to hold delicate subjects. 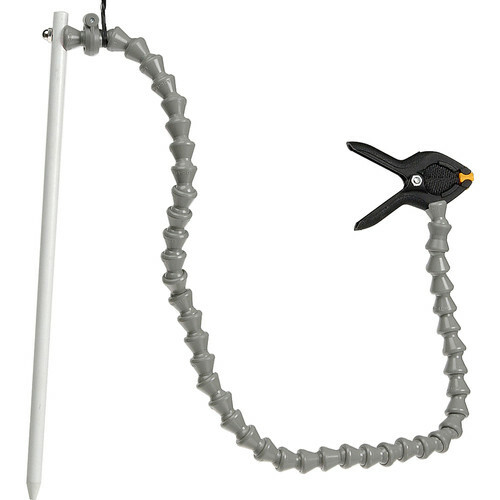 This clamp is also avialable in a version that clamps to a tripod or light stand -- THE CLAMP (#MCLMP). Stores flat in camera bag and includes a nylon carrying bag. Box Dimensions (LxWxH) 18.0 x 10.0 x 1.0"
McClamp The Stick - Micro Clamp and Soil Anchor is rated 4.4 out of 5 by 7. Rated 4 out of 5 by jtmcg from Useful accessory I got this and the McClamp in time for spring wild flower season and have used it several times. I've used it to hold wild flowers still so they could be shot without flash. The clamp has foam rubber between the jaws so that the flower stem isn't damaged. I've also used it to hold a 12 Lite Disc reflector. Since the stick can turn in the ground however, it requires a little more effort to get it to stay where you want it. Rated 5 out of 5 by Anonymous from Excellent solution The beauty of the stick is that you are not limited by the distance from your tripod to the object you want to secure. This makes it much more flexible than solutions that secure to your tripod. It also secures plants without damaging fragile stems. The only down-side would be if you find yourselv working in an environment where the soil is granite or some other impenetrable surface. Rated 5 out of 5 by Amanda from Great for flowers and plants! If you do any kind of botanical photography in natural settings, I highly recommend McClamp The Stick. It allows you to stabilize your plants and prevent movement from wind without you to be dependent on your tripod. I HIGHLY recommend this product. I've used it numerous times in formal gardens and in the wilderness. Rated 4 out of 5 by Anonymous from McClamp The Stick Very useful for macro work. It's better than the Mclamp that clamps on the tripod. Rated 5 out of 5 by Patricia from How to make your life easier... Wonderful helper when doing macro shots! Rated 3 out of 5 by JOHANNA K. from Useful This is a useful little gadget. What it lacks, though, is a second clamp, and/or two sizes of clamp, so that it could serve double duty. I don't like that the manufacturer carefully arranged it so that you have to buy two or even three of these gadgets, each configured slightly differently, to do closely related tasks. Greedy, folks! How long is the stick part of this FM Photography McClamp The Stick? Want to see if it will fit inside my bag.